Crispus Attucks Charter School is part of the broader transformative work of its parent organization — Crispus Attucks Association — which has offered comprehensive social services to the community in York since 1931. The school has operated a YouthBuild program since 1994. For more than 20 years, the charter school has operated a successful YouthBuild program, resulting in the rehabilitation of over 15 single and multi-unit properties for use as affordable or transitional housing for low-income individuals or families. Today, the charter school’s 26 staff members serve 100 students each year. Take a look at a Crispus Attucks Mental Toughness Orientation. YouthBuild Philly works in the poorest large city in the U.S. 90 percent of students are low-income and 49 percent young parents. Since 1992, YouthBuild Philly has grown to become the largest YouthBuild program in the country. It now serves about 220 students a year. Through a mixture of academics, vocational training, and AmeriCorps service hours, program outcomes include a 70 percent educational attainment rate, and a 72 percent placement rate in post-secondary education or employment. Read about the annual YouthBuild Philly student march to reclaim their education. The Christian-based, nonprofit community development corporation has been revitalizing Pittsburgh with housing and workforce development programs since 1983. Garfield Jubilee Association's YouthBuild program offers a high school diploma, vocational and pre-apprenticeship training in construction, healthcare, and customer service, and dual-enrollment in community college. Other services include life skills, career exploration, and job readiness and placement. Some 70 students are served per cohort. Read about the impact Garfield Jubilee Association is making in the neighborhood. With roots in the Goodwill Methodist ministry started in 1902, the YouthBuild program in Johnstown continues its mission of empowering individuals and their families. The program is a 9-11 month blend of education and on-the-job training for individuals ages 17-24, offering a chance to earn a GED and get career ready. 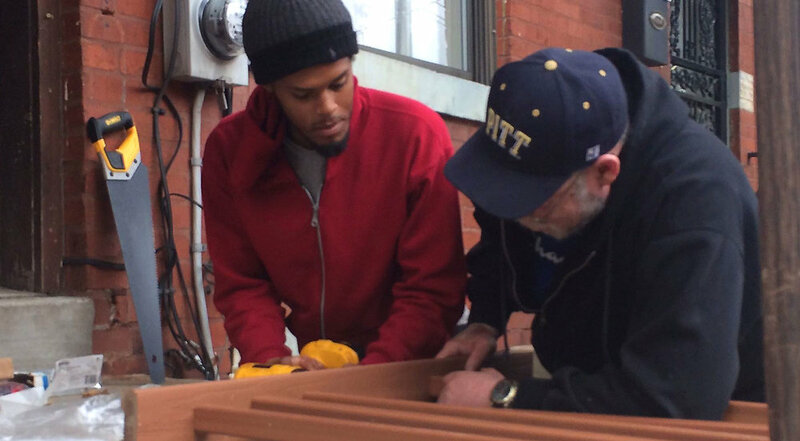 As YouthBuild students, youth also build and rehabilitate housing for the homeless and low-income residents. This expands the supply of affordable housing, provides meaningful work experience, and helps youth become responsible members of the community. Check out how Robert Lamb changed his life — and his community. In partnership with the United Labor Council of Reading Berks and the United Way of Berks County, Reading's United Community Services is a key labor advocate and community resource. In 2009 UCS was selected by a community coalition to be the host site for YouthBuild in Berks County because of its years of experience facilitating pre-apprenticeship programs for youth since 2004. The goal: through education, reduce the disproportionate number of minority youth in the juvenile justice system. To that end UCS YouthBuild has served 200 participants to date while partnering with the Reading Housing Authority, and maintains on average a 70 percent placement rate in employment, post-secondary education, and certificate attainment. Read about U.S. Sen. Bob Casey's visit to UCS. HADC was formed in 1978 to combat the blight in Allentown's residential core. Its YouthBuild program is part of its mission to build healthy communities by investing in its people. HADC's YouthBuild is a six-month program that includes GED instruction, certificate programs at Lehigh Career and Technical Institute, and on-the-job training at HADC project sites. Students are eligible to receive a weekly living allowance for their work and participation in the program. When the renovation work is complete, HADC sells the house to an income-eligible buyer or adds the location to its inventory of rental properties. Watch how Ian Rodriguez's life was changed.